PLEASE inquire with your questions before clicking on instant booking to avoid costly cancellations in case of misunderstandings. Lone Spruce Ranch is one of the most unique vacations you will ever take. Located 'somewhere between Peace & Quiet', this cabin is nestled in the middle of the Black Hills National Forest, 20 miles northwest of Hill City. It is part of ten acres that is completely surrounded by Federal forested land. A stream is on the property. This is the ideal property for hiking, hunting, relaxation and ATVing. One bedroom with a queen bed is located on the lower level along with a full bathroom, the living room, dining area, kitchen and laundry room. A full mattress futon sleeper is located in the living room. The spacious loft room has two queen beds and a full bathroom as well. Everything you need is included in the cabin. A beautiful gas-log fireplace is the centerpiece of the living room with a flat screen TV. There is a TV in the lower level bedroom as well. There is a wall AC unit on the lower level and ceiling fans in the loft.. Please note that the photos you see on this site are current photos and have not been digitally enhanced. You will be about one-half hour from Mount Rushmore, Crazy Horse Mountain, and Custer State Park. You will have total privacy and relaxation on site. This is a favorite cabin for our repeat guests! Due to the seclusion of this property, there is no hot tub, no internet access, and no cell service. This cabin is NOT recommended for motorcycle enthusiasts because of the GRAVEL ACCESS. We are Vacation Home and Cabin managers with Heart of the Hills Vacation Homes in Hill City. We own several of the cabins on our roster including this cabin and have 4 of our personally owned cabins listed with VRBO. (2) land line for local calls. Please bring a phone card if you need to make long distance calls from the cabin. Your cell phone will not work from this location. Televison in living room and in the downstairs bedroom. 10 acres surrounded by National Forest! Was a great stay --- loved the seclusion of it and having no cell service was just what the doctor ordered -- great to truly unplug and enjoy! Also for anyone looking for trails - bring your ATV! They're accessible from the cabin without having to drive anywhere! Great fireplace - nice and homey and quiet!!! Also they even had a 8-track player! Bring those 8-tracks. A place you will surely enjoy and don't leave without visiting Rochford --Moonshine Gulch Saloon!!! Also Deadwood is closer and easier drive then Hill City for restaurants and must need pick up items. Wonderful location for 4 wheeling the trails. We never had to trailer our machines anywhere. The cabin was very clean. We saw lots of deer and turkeys. Centrally located to attractions yet secluded and peaceful. We had an absolutely AMAZING stay at your cabin. It was everything we hoped for and more! Really appreciated the water cooler as we weren't accustomed to the water in this area. The beds were so comfortable! Plenty of room for the four of us. Recommendations to future renters - I would bring a griddle if you are a big breakfast family, for cooking french toast, pancakes, eggs, bacon, etc. That is the one thing we didn't think to bring. There are plenty of utensils and skillets, and bowls to store and mix in, I think we just eat a lot. :) We did bring a crockpot and roaster to get our meals ready in the mornings, and then go out and ride horses and enjoy the area all day. It worked well for us. I would suggest getting your groceries as you go through Hill City before you head to the cabin. It is a jaunt the first time. After that, you get used to the drive. Note there is no cell or wi-fi unless you drive 20 miles into town. The owners let you know that ahead of time. There is a house phone, but be sure to bring a calling card (we didn't think of that) because you can't call long distance (home) without it. We had the opportunity to meet a few locals, and the vet up the road, as they were out our way looking for cattle. We had a great time riding our horses, and best of all, having the area completely to ourselves, to get away from the world. Plan to stay again! Marcia Benning is an excellent host - very responsive and friendly. I would definitely recommend this cabin without any reservations. It was SO nice to get away and disconnect from the world for a few days! No cell service, no WiFi, and clean mountain air. We went trail riding on our 4wheelers every day and enjoyed the most beautiful Mountain views! The cabin was in need of a few small repairs but overall it was a wonderful experience! 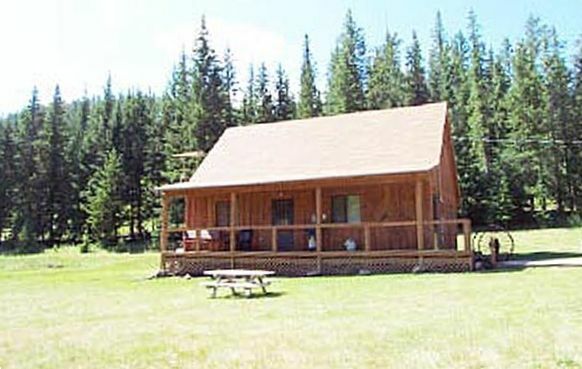 The Lone Spruce Ranch is the ultimate place to get away from it all! Located on 10 privately owned acres completely surrounded by the gorgeous Black Hills National Forest. You are completely secluded yet within a 40 minute drive to most major attractions. Our repeat guests love this location because of the privacy and serenity it offers. Plan your day trips to the attractions and come back to the Lone Spruce Ranch to relax, unwind, enjoy family time, and the night stars! Perfect for repeat guests that just want to get away and enjoy the hills, lakes, wildlife, and possibly a trip to the village of Rochford to enjoy a burger and a beer at the Historic Moonshine Gulch Saloon.